Pork cheeks are a delicious and much under-rated cut of meat. 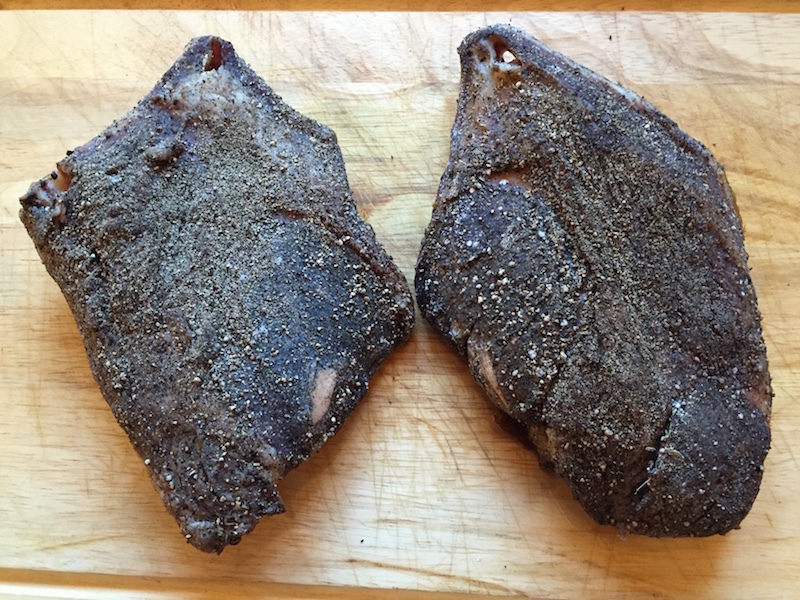 I usually get a couple in my regular meat box from The Well Hung Meat Company, and most often I sous-vide them (62˚C, 48 hours), then roast them in the oven to crisp up a little. This month, I decided to try something a little different. 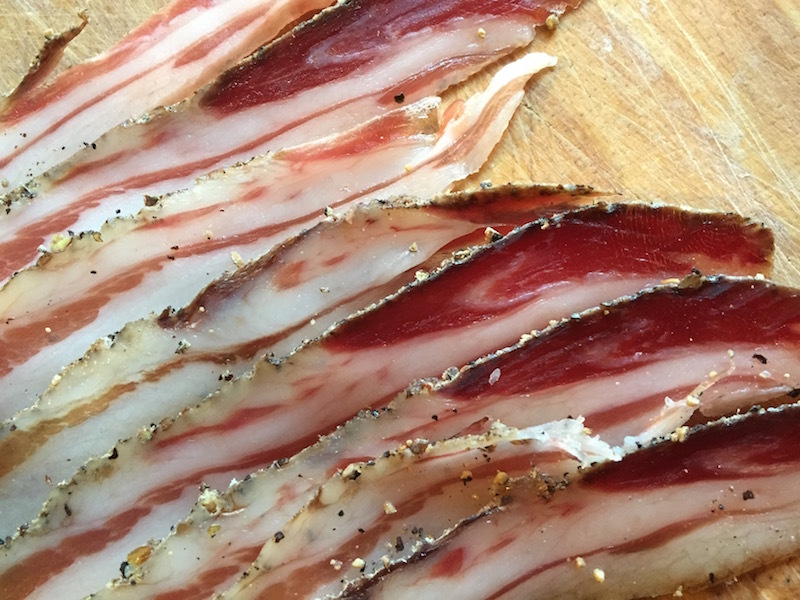 Guanciale is an Italian cured meat made from pork cheeks. Now, I’ve been reading a lot about curing just lately, but hadn’t yet ventured forth and actually made anything. So, this seemed like a fine opportunity to start. 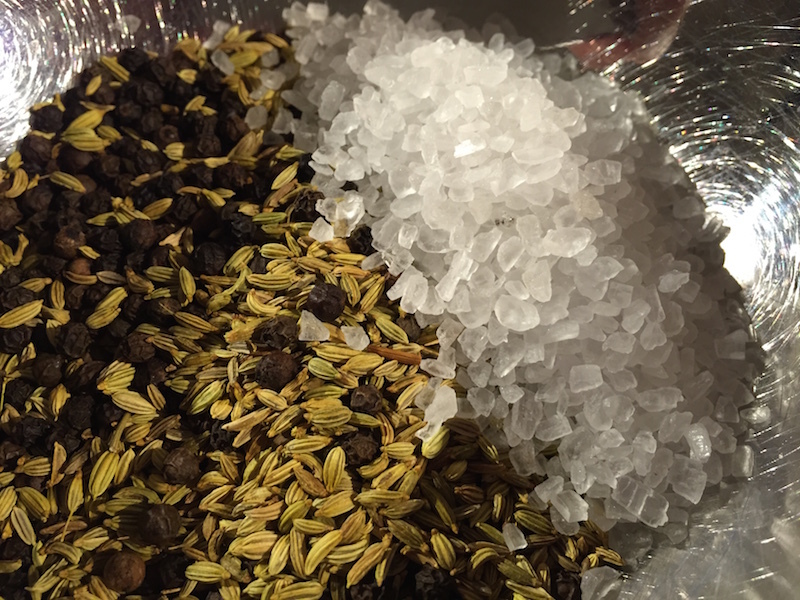 I must have read a dozen recipes for making guanciale, and finally settled on a cure consisting of 3% sea salt, 3% black pepper, 1.5% fennel seeds (percentages are of the total weight of the pork cheeks). 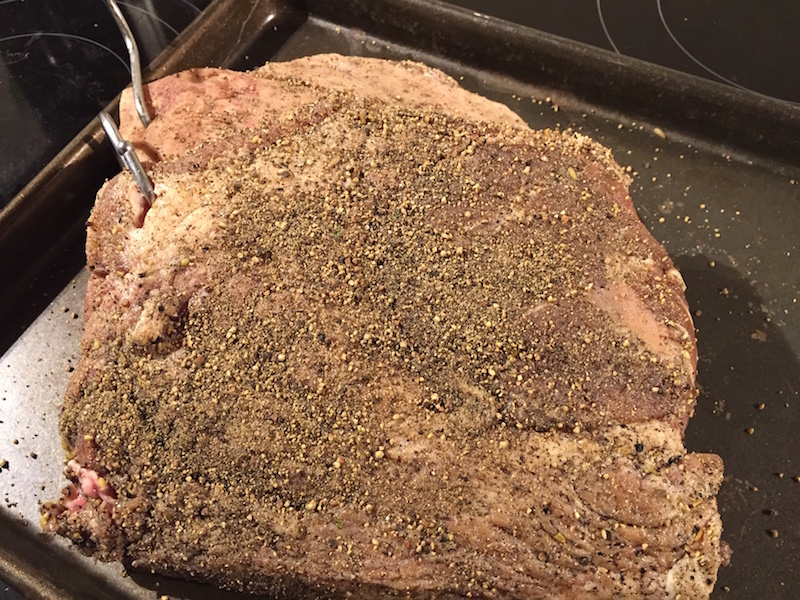 I ground up the salt and spices in the grinder, liberally coated the cheeks with the cure and then packed them in zip-loc bags. They then sat in the fridge, weighted down, for four days, turned over every day. 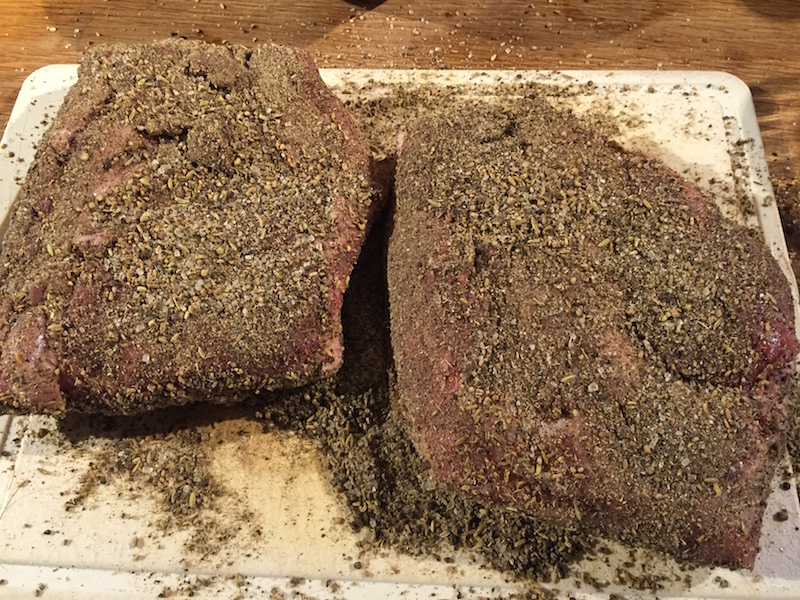 After four days, I took them out, washed them, and then covered them with more black pepper and fennel. They were now ready for hanging. I hung them in the shed, and then went away on holiday for two weeks – that was a good way to make sure I left them alone and didn’t prod and poke them a couple of times every day to see how they were doing. They’re ready when they lose 30% of their original weight, and in the end, it was about four weeks before we hit the magic number. I brought them in – they looked magnificent! The rind was rock hard – I couldn’t cut through that. 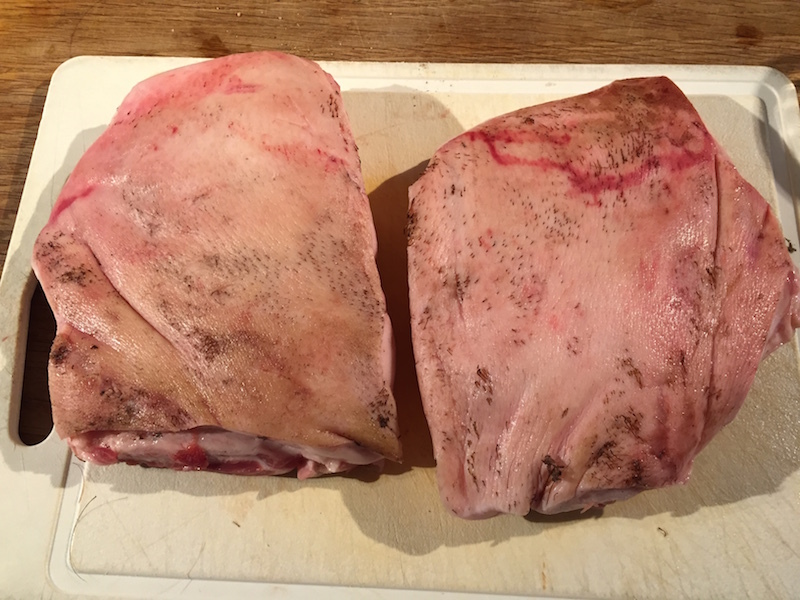 I carefully cut it away with a small knife, and then cut some thin slices of the meat. I sampled a piece raw – very soft, with a delicate, slightly sweet flavour, with a bite of black pepper from the cure. Very tasty. Next, I fried a few of the slices in a pan – these crisped up very quickly, the whole thing took less than a minute. These were absolutely delicious. Crisp, sweet and full of flavour. 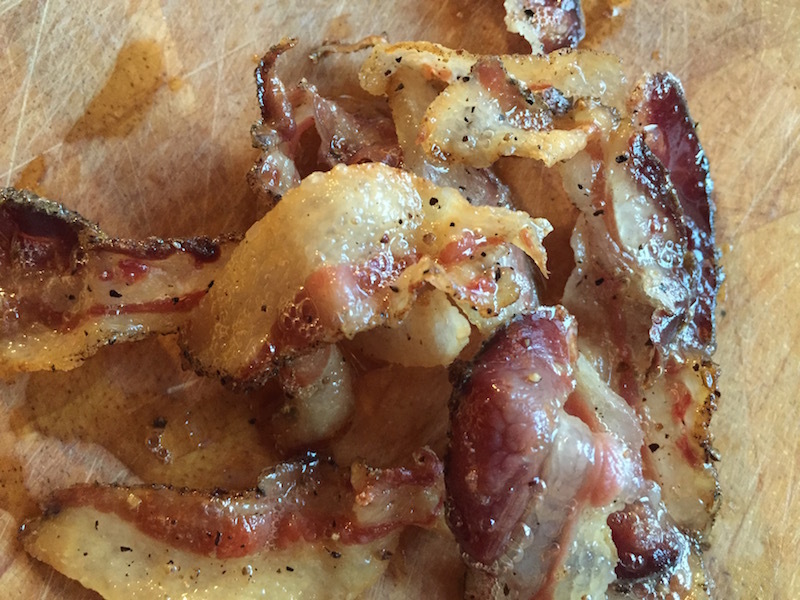 I think my first stab at guanciale was a resounding success. I’ve wrapped one cheek in paper and put it in the fridge, the other, I’ve left hanging in the shed for a little while longer. We’ll see how that one matures. It tastes way better than anything left dangling in a shed for a month should. Raw, the meat is sweet. Fried it’s all delicious except for the smell when it’s cooking. I didn’t like that so much. This house desperately needs an extractor over the stove, given what Dave does out there, but with a ceiling only inches above our heads I can’t see how we can have one.